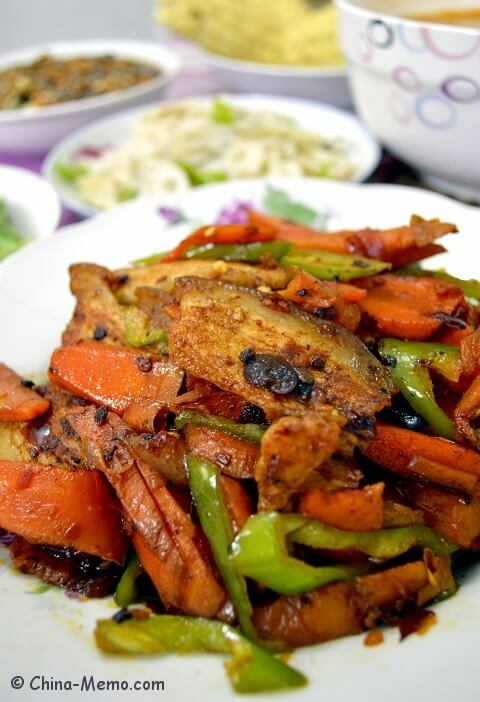 Chinese twice cooked belly is one of our family favorites. 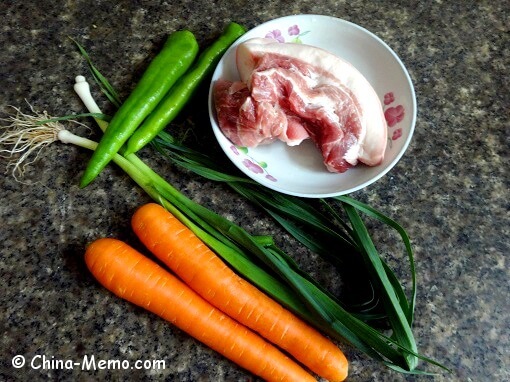 The boiled pork belly is fried with green chili and cooked carrots, full of flavor. Scroll down to watch the cooking video. The name of “twice cooked” is because we boil the pork belly first, then cut the meat into thin slices and fry with the vegetables. 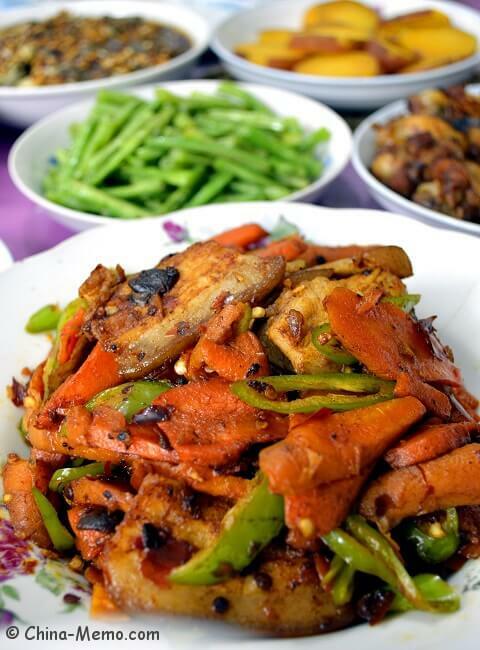 The dish usually has a very rich flavor after seasoning by Chinese chilli bean paste, sugar and garlic. I have posted my version of twice cooked pork belly, in which I fry the pork belly big longer, so the belly is bit crispy. My parents usually prefer the meat to be tender and moist. My father cooked this dish using pork belly and green chilli and the cooking video appears to be very popular in my Youtube channel. 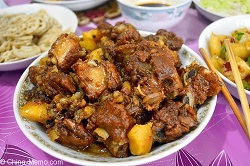 Its number of views is only second to my mum’s dish Sichuan “Tiger Skin” KouRou (steamed pork belly). 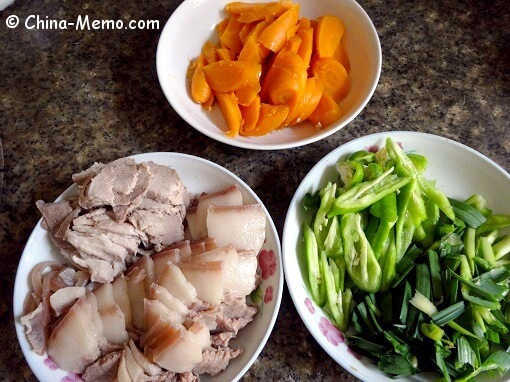 Here is my mum’s home cooking for Chinese Twice Cooked Pork with Carrots. For the best result, the pork belly should have the skin because the skin gives a different texture and tastes good too. • Bring the water to the boil. Cook the pork belly for about 5 minutes. Once cooked, take the belly out and cut the meat into thin slices. • Prepare the vegetable. Cut the green chilli. Boil the carrots until they soften; then cut the carrots into small chunks. Set aside. 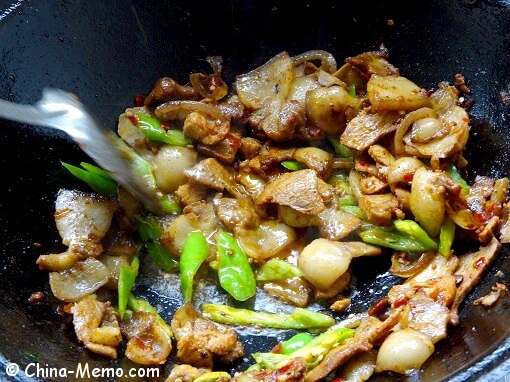 • Heat up the pan or wok until it is very hot then add the oil. 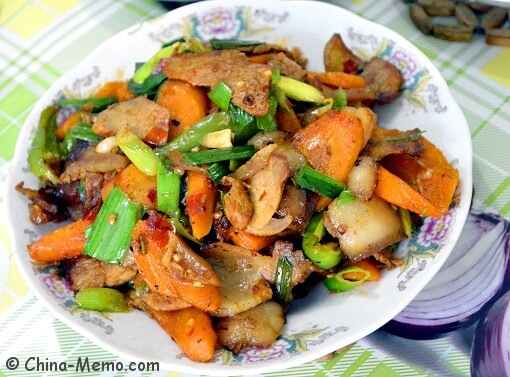 Quick fry the Chinese chilli bean paste until fragrant (for less one minute). If use garlic cloves, fry garlic too. If use garlic leaf, leave it later to fry with carrots. 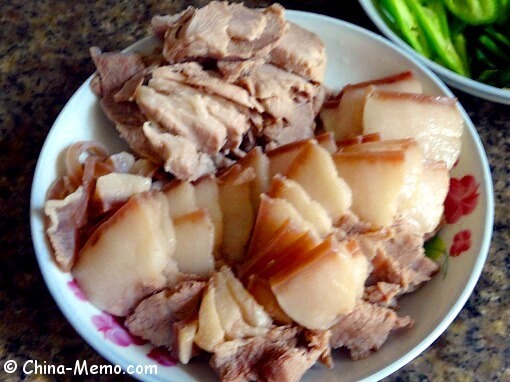 • Return the sliced pork belly, seasoning with salt, sugar and light soy sauce. Stir fry for about 5 minutes or until the oil starts to come out from the belly. If you prefer the belly to be slightly crispy then cook it for a bit longer. 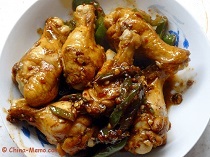 • Add green chilli into the belly and stir fry for about 3 minutes or until green chilli soften. 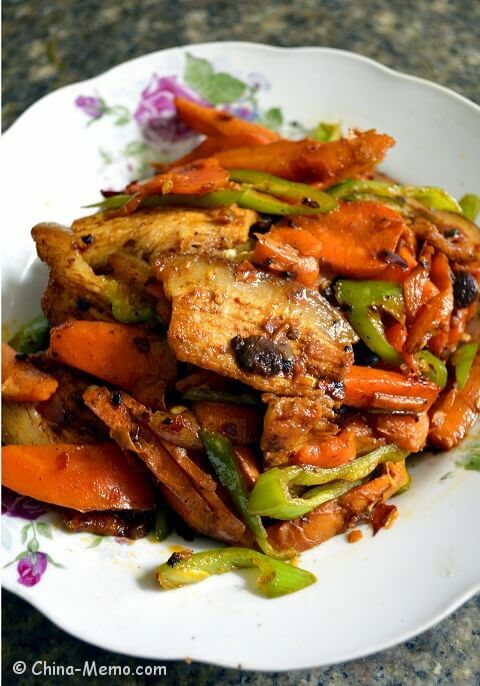 • Add carrots to mix with belly and green chilli for about 3 minutes. You may add salt to carrots if you prefer. Serve hot. I have posted the cooking video on my Youtube channel. Please subscribe to my Youtube channel to get the regular updates. Like this recipe, or want to share it with a friend by a special way? I have made a postcard for this recipe, which is now available from our store on Zazzle. free to share with friends on Facebook and Twitter.